Metal-clad airships are airships which have a very thin airtight metal envelope, rather than the usual fabric envelope. This shell may be either internally braced as with the designs of David Schwarz, or monocoque as in the ZMC-2. Only four ships of this type are known to have been built, and only two actually flew: Schwarz's aluminum ship of 1893 collapsed on inflation; Schwarz's second airship flew at Tempelhof, Berlin in 1897, landed but then collapsed; the ZMC-2 flew 752 flights between 1929 and scrapping in 1941; while the Slate City of Glendale, was built in 1929 but never flew. One of the earliest proposals for a flying machine based on rational principles was Francesco Lana de Terzi's design for a vacuum airship, c.1670. 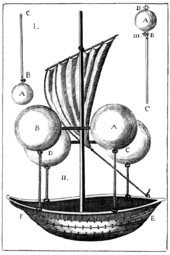 He had measured the pressure of air at sea level and based on this he proposed the first scientifically credible lifting medium in the form of hollow metal spheres from which all the air had been pumped out. His proposed methods of controlling height are still widely used; carrying ballast which may be dropped overboard to gain height, and venting the lifting containers to lose height. In practice de Terzi's spheres would have collapsed under air pressure, and further developments had to wait for more practicable lifting gases. The concept of a metal-clad dirigible airships was again explored in the late 1800s by Russian rocket theorist Konstantin Eduardovich Tsiolkovsky. He wrote that since his teens (in the early 1870s) "the idea of the all-metal aerostat has never left my mind" and by 1891 he had produced detailed designs of a variable volume corrugated metal envelope airship that did not need ballonets. These were submitted to an Imperial department for aeronautics, which convened a conference to consider it. In 1891 they declined his request for a grant to produce a model, considering the idea "cannot have any considerable practical importance". In 1892 he published his designs as Aerostat Metallitscheski (the all-metal dirgible aerostat). At around the same time, in 1892 the Russian Imperial war ministry agreed to let Schwarz build his metal airship in St Petersburg, though at his own expense. Schwarz's first aluminum ship of 1893 collapsed on inflation. His second airship flew at Tempelhof, Berlin in 1897, landed but then collapsed. In 1926 the Aircraft Development Corporation announced in Detroit, USA, that they were planning to construct a prototype. The 1929 Slate All-Metal Airship, built in Glendale, California, had a hull constructed from corrugated aluminum panels, along with a revolutionary propulsions system consisting of a "blower" at the nose of the airship which would propel the vehicle forward by creating a partial vacuum ahead of the vessel. The centrifugal propulsion was later replaced by a conventional engine and propeller mounted on the tail end of the airship's gondola. The rolled seams intended to hold the panels together subsequently unrolled owing to gas pressure created by superheating during an attempted launch of the airship. The U.S. Navy's ZMC-2 was one of the few airships to be constructed in the late 1920s. An all-metal airship was not a completely new idea; the first metal-skinned rigid airship was completed by David Schwarz in the 1890s. The constructors of the ZMC-2, however, developed a system of framework integrated with stressed-skin construction that presaged both the pressurized fuselage construction utilised decades later in commercial airliners, and even elements of American lunar rockets, such as the Saturn V launch vehicle. The ZMC-2 was successful both in performance and longevity. Its manufacture required the development of a riveting machine and final assembly that are comparable to modern rockets and transport aircraft fuselages, while being capable of dealing with aluminum skin thicknesses thin enough to allow aerostatic lift. The final assembly of the single closing seam of the two hull-halves took over two months. Filling the rigid shell was similarly problematic, requiring an expensive and time-consuming process of filling it first with carbon dioxide, then with helium, and finally purifying the helium by scrubbing residual carbon dioxide from the helium. In addition, the hull had to be strengthened to sustain the weight of the carbon dioxide during the filling process. In the early 1950s, Luftschiffbau-Zeppelin GmbH commissioned a design study to explore the construction of the LZ-132. The project was abandoned. Between 1982 and 1995, American Skyship Industries, a subsidiary of Wren Skyships Ltd. of the Isle of Man in Great Britain and itself a spinoff from Airship Industries, promoted its metal-clad airship projects in the USA, receiving substantial state loans but never delivering a product. ^ Ege 1973, p. 7. ^ Von A. Kosmodemyansky, X. Danko. 2000. Konstantin Tsiolkovsky His Life and Work The Minerva Group, Inc., ISBN 0-89875-138-1. ^ Kosmodemyansky 2000 pages 18-19 "In 1885, at the age of 28, I decided to devote my energies to aeronautics and elaborate the theory of the all-metal dirigible." ^ "Metal-Covered Airships, Carriers of the Future". Trove.nla.gov.au. 1926-02-27. Retrieved 2014-04-02. ^ "The Slate All-Metal Airship". Flight: 101. 27 February 1929. ^ Robinson, Douglas H (1973). Giants in the Sky: History of the Rigid Airship. Henley-on-Thames, UK: Foulis. pp. 5–6. ISBN 978-0-85429-145-8. ^ a b "NAS Grosse Ile Aircraft". Nasgi.net. Retrieved 2014-04-02. ^ Philpot, Mike (2012-12-11). "Varialift Airships event notice" (PDF). aerosociety.com. London, UK: Royal Aeronautical Society. Archived (PDF) from the original on 2013-05-14. Retrieved 2013-09-23. ^ Khoury, Gabriel Alexander (February 2012). Airship Technology. Cambridge aerospace series (2nd ed.). Cambridge; New York: Cambridge University Press. ISBN 9781107019706. OCLC 748941704. This page was last edited on 19 September 2018, at 05:19 (UTC).